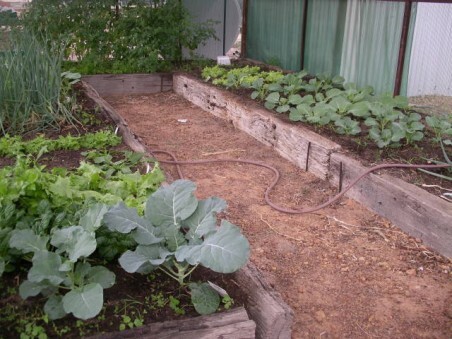 Well the winter vegies are in and growing well. Thanks to my daughter who took the picture for me…(school holidays = bored kids= urgh) I only have a small vegie patch but it still grows plenty. Nothing like having your own grown vegies, especailly as the prices for fruit and veg in the country are horrible. My boy loves picking fresh grown carrots and munching on them…I just wish he could wait until they get bigger than his finger. They never make it to the plate..at least he’s eating them and not the rabbits. We’ve got spring onions, broc, cauli, cabbage, beetroot, carrots, tomatoes, a few kinds of lettuce, celery and capsicums. With the cool weather, the gardens are starting to come alive again and not look so dry and burnt – and its less watering I have to do, more time I can spend writing.